What happens when you mix beer, brown sugar, molasses and overripe bananas and paint it on the side of a tree? You might get some funny looks. But staff members and volunteer participants at Lloyd Center for the Environment hope this mixture will attract moths and help them learn more about the winged insects. The National Moth Week Hunt will take place from 8 p.m. to 2 a.m. Friday at the center. This is the second time Lloyd Center has participated in this official event, held in conjunction with a nationwide effort to document moth species. National Moth Week celebrates the beauty, life cycles, and habitats of moths, according to nationalmothweek.org, the organization that sponsors the effort. Citizen scientists across the country will hold events similar to the Lloyd Center’s, where they will gather and log the moths found in various parts of the nation. The numbers could impress. Although people may think of moths merely as clothes eaters or tree defoliators, there are 2,500 species of moths in Massachusetts, said Mark Mello, research director at Lloyd Center. That is 20 times the amount of butterflies, which number about 120 species. They range from leaf miners, which can be one-eighth of an inch wide, to cecropia moths, with a 6 ½ inch wingspan that can resemble a bat. The Lloyd Center has been collecting moth data on its 82-acre property since 1983, amassing records of more than 700 species. Moths may be viewed as nuisances, but they play an important role in nature, Mello said. Moths help with pollination, Mello said. “Bees get all the credit but moths and butterflies pollinate,’’ he said. 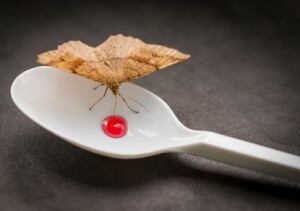 Moths also serve as prey for a range of creatures, including frogs, birds, bats, dragonflies and even squirrels, which eat the moth pupa in the winter. “It’s tough to be a moth,’’ Mello said. When the sun sets Friday and darkness envelops the center grounds, participants will see what species of moths have taken the bait. “They might be a little tipsy,’’ Mello said with a laugh.